Home > I o T > Are IoT endpoints the key to security revenues? 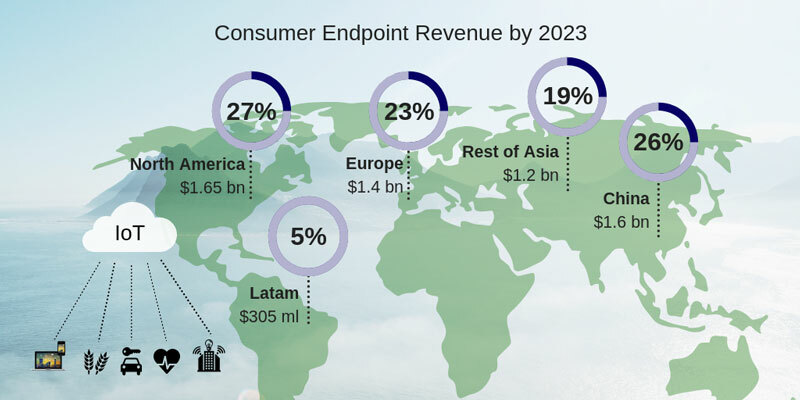 Total global endpoint security revenues will rise three-fold from $2bn per year at present to $6bn by 2023, outstripping the average for cyber security over the next five years, despite security still being a grudge purchase which everybody hates. The report comes from Riot, the IoT research service of Rethink Technology Research. Investment in IoT endpoint security will be led by the commercial sector where enterprises have already committed over $1bn a year globally securing vertical industry-specific applications, and spending will grow in business and industrial sectors 20-fold over the next five years. This is about half the global endpoint security total. These are among key findings of the latest Rethink Riot Research forecast on IoT Endpoint Security through 2023. The report predicts numbers of IoT endpoints in six different sectors (smart city, consumer, commercial, connected car, healthcare, and agriculture) with associated costs. These are broken down by five geographical sectors, with China separated from the rest of Asia in recognition not just of its size but also differences in priorities from its immediate neighbours. Currently, there are vast differences between IoT sectors in commitment to security, which do not necessarily reflect the risks. Consumer IoT devices such as security cameras have already been recruited into botnets that have launched devastating DDoS (Distributed Denial of Service) attacks, but since users themselves are not the victims, they are unwilling to pay for security which would resist such compromises. By contrast, commercial enterprises are starting to make the necessary investments, because they risk reputational damage if their devices are exploited in botnets, as well as stiff fines from regulators and share price falls. 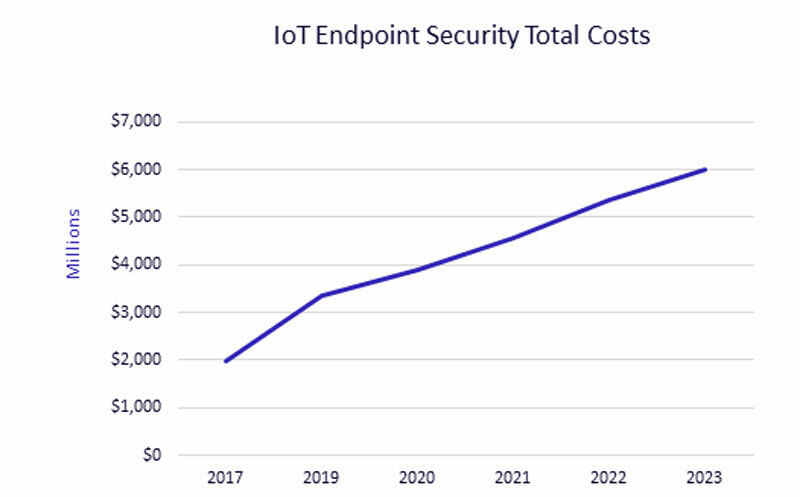 As a result, the cost of security for commercial horizontal IoT endpoints comprising devices common to many business and industrial sectors is set to soar 20-fold over the next five years. This is four times faster than the number of endpoints themselves, reflecting increasing concerns over threats these devices pose. The report also highlights stark geographical differences over penetration of endpoints and therefore associated costs. North America, principally the US, stands out as a strong early adopter of IoT in healthcare, agriculture and consumer IoT. North America will continue to invest strongly in these sectors but the gap, especially in percentage terms, will narrow as other regions catch up. In healthcare, China will surge forward on a huge investment wave, set to more than double its share of all IoT endpoints in this sector by 2023.